Most of the time, concept cars aren’t really cars. They have no engines, or can only move at very slow speeds. Sometimes, the door don’t even open. Concept cars are all about visual impact; they show what car companies are capable of with their styling. However, there is at least one concept that makes noise when you press the starter button. The Bertone Nuccio was originally unveiled at the 2012 Geneva Motor Show, as a celebration of the Italian styling house’s 100th anniversary. Now, the Nuccio is making a second appearance at the Beijing Motor Show, and Bertone says it is fully drivable. Underneath the stylish skin is the chassis from a Ferrari F430, the car that preceded the 458 Italia. The Nuccio retains the F430’s 4.3-liter V8, but the engine has been tuned to produce 480 horsepower instead of the Ferrari’s 490. However, Bertone says the Nuccio is lighter than an F430, so it will be interesting to see if there is any difference in straight-line performance. The V8 is mated to the Ferrari’s six-speed transmission, which features Formula 1-style paddle shifters. The transmission is less sophisticated than the double-clutch unit in the 458, but it’s better than nothing. Bertone made one unorthodox alteration to the Nuccio’s lights to make the car road-worthy. The running lights glow brighter when the car is braking; Bertone says this is to alert pedestrians that the car is slowing at intersections. After all, isn’t it better to have more, even when it comes to brake lights? The Nuccio’s headlights appear to be taken from the same F430 donor. 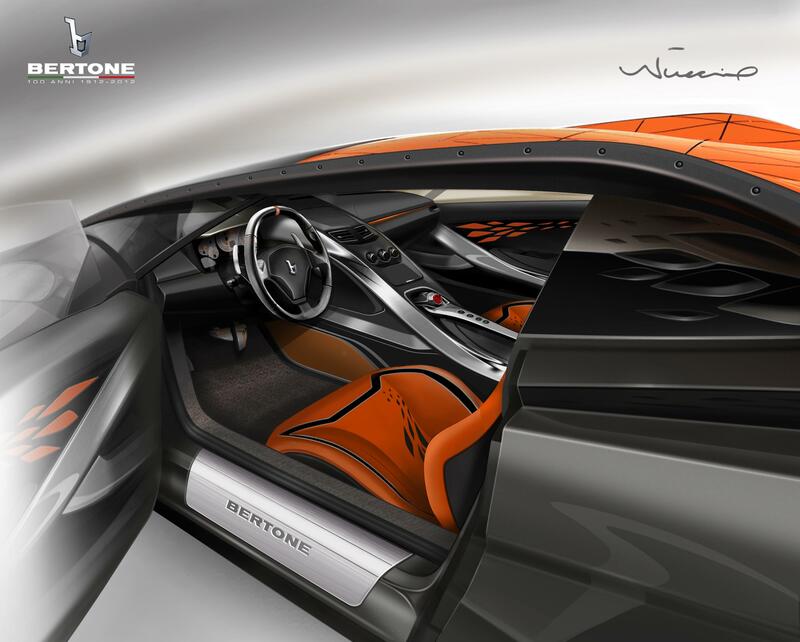 The Nuccio is one of the only concept cars to have a full interior. It is toned down a bit from other concepts, but it’s also more functional. You don’t control the throttle with a touch pad, but you do get heavily bolstered sport seats and an inclined center console that brings controls closer to your right hand. 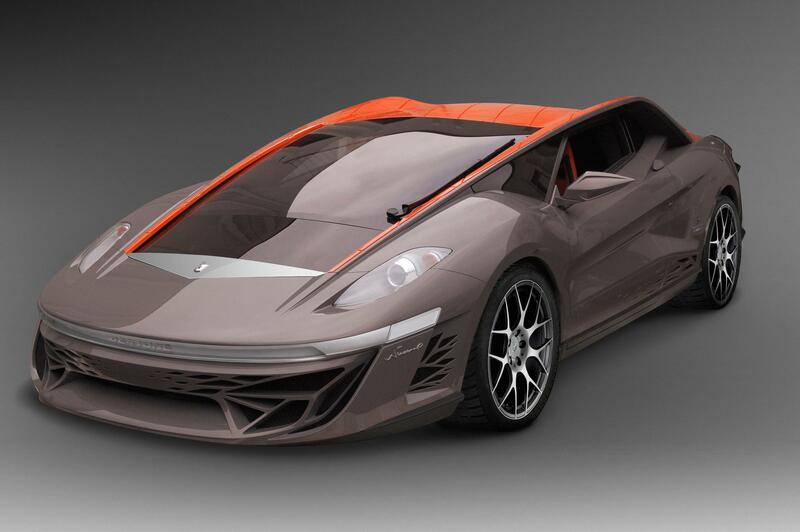 Like the outside of the car, the interior gets a splash of orange to contrast with the mostly gray surfaces. The Nuccio is named after Nuccio Bertone, the son of company founder Giovanni Bertone. Nuccio ran the company from 1950 until his death in 1997, and produced some of Bertone’s most memorable designs. To honor him, current Bertone designers took styling cues from three of the styling house’s greatest cars: the 1968 Carabo, 1970 Stratos Zero, and 1973 Lamborghini Countach, to create the Nuccio. It’s easy for a concept car to look good while rotating on an auto show stand, but these vehicles are usually too fragile for the real world. Bertone tried to change that, and hopefully the Nuccio will turn as many heads on the road as it did at Geneva and Beijing.